At the first look the book just gives an interesting collection of old Jūjutsu techniques, but it also allows an internal view on the state and direction of Jūjutsu at the time. The writers, publishers and contributors were mostly prominent experts of Jūjutsu and its different related systems, or were from families with a strong Bujutsu background. Although the book is from the middle of the Meiji era, the guilds those persons belonged to developed in late Tokugawa era, and thus were rooted in the Koryū traditions of Japanese martial arts. The techniques described in the book are obviously a compilation of techniques for a certain need, namely for training policemen and military personnel. This is not only indicated by the fact that some of the persons had official posts in Police stations, but also by the writings in the forewords and afterwords. This strongly indicates that the book’s techniques were meant to constitute a training guide in sense of Torite 捕り手, a term describing ancient policemen specialised in dealing with, capturing, and arresting criminals, or in Budō generally describing techniques of arresting. that the techniques have been chosen by police superintendent Hisatomi Tetsutarō by way of consulting 16 different Jūjutsu experts and compiling what he thought was fitting for his intent. Apart from that, most of the contributors of the book have their own interesting story and status and there are also some traces pointing to styles from which a part of the techniques probably were taken from. The actual author of the book was Hisatomi Tetsutarō, and Iguchi Matsunosuke was the editor and publisher (some bibliographical references of Japanese libraries only name Iguchi Matsunosuke as the author, which seems to be not correct). It is only in Iguchi’s foreword where he explains that Hisatomi gathered all the techniques and wrote the technical descriptions to it. Concerning the issuing date of the book, it is correctly given as 1898, because this is the year of it’s first publishing. However, the actual contents of it were compiled by Hisatomi over the course of nearly three years already between 1884 and 1886. This really sounds fitting to the stories that the Japanese lost interest in their own culture in early Meiji era, only to rediscover it around this time with full vigor. We do not rely on the likelihood of the enemy’s not coming, but on our own readiness to receive him. This is short quote from the Sunzi Bingfa (Sun-tzu: The Art of War), Chapter 8: The Nine Variations in Tactics. Nr.7. 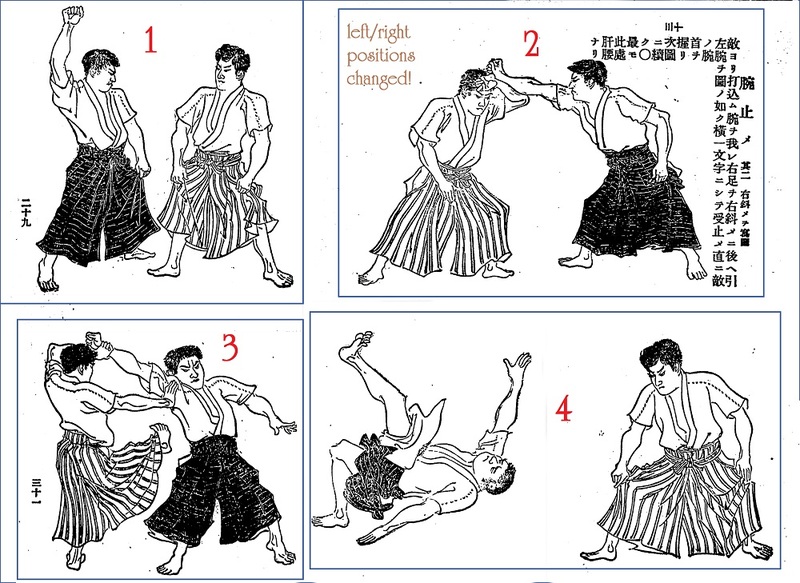 what style of Jūjutsu he practiced. In his preface he explaines that when he was put into office as police superintendent (keishi 警視) – as I surmise in Tōkyō – in the preceding year (i.e., 1897), he had a sense of need to train his personnel in Jūdō in order to enforce the law against villains, and he put that plan into action. In fact it was Hisatomi who chose the techniques for the book. In this Jūjutsu book in discussion, Iguchi wrote a foreword (pic 12-13, new numbering pp. 1-2), dated the last third of April 1898, in which he talks about the book’s development. According to that, the book was drafted between 1884 and 1886 in an overall time of about three years. 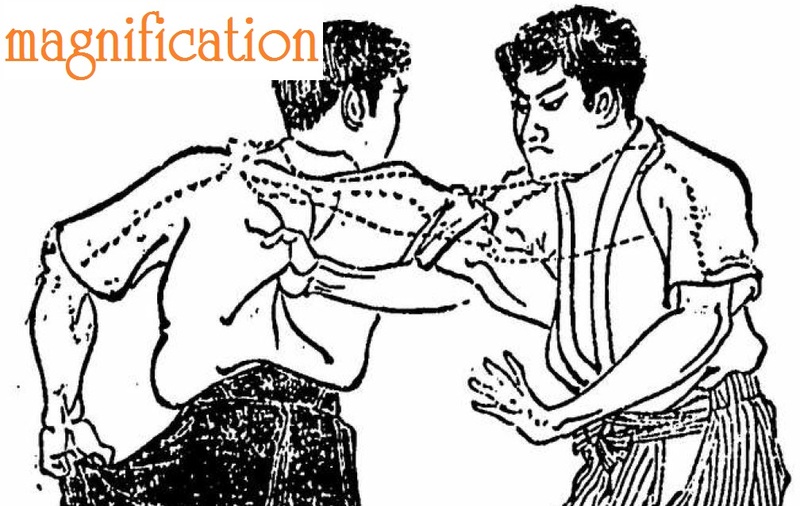 It was done by the police superintendent Hisatomi Tetsutarō, who consulted 16 Jūjutsu experts and from what he was shown he had chosen over 30 brilliant moves (techniques), which he wrote down. He hoped that this compilation would reach the policemen and military personnel of the country of Japan, as well as various school teachers and their students. He furthermore hoped that it would be widely received among educators and that the book would flourish among the children so that they would come to like Bujutsu. Among the masters Hisatomi consulted was Imaizumi Hachirō and many other masters, and the illustrator Adachi Ginkō made “copies” of the displayed abilities (either in photograph or drawings), which were then made up and placed in the book as illustrations, showing different angles of the moves in order to make it easier to comprehend. manager of the Enbukan 演武舘 dōjō of Shinkage-ryū Jūjutsu 眞蔭流柔術. Just like superintendent Hisatomi Tetsutarō he worked for the Tōkyō police. photograph or by drawings, he “copied” the chosen techniques and from it made the illustrations for the book. It is not known much about him, apart from him being active between 1874-1898 as an Ukiyo-e printmaker. One foreword was written by Sugiura Shigetake 杉浦重剛 (1855-1924), who was the Principal of Nihon Junior High School. He was born in 1855 in Zeze in Ōtsushi, Shiga prefecture (Kinki area). His childhood name was Jōjirō 譲次郎, his buddhist name Baisō 梅窓. He studied Chinese and Dutch and later went to England where he studied Chemistry. With his broad view and knowledge he contributed greatly to the Japanese scholarship of the time and is still greatly respected. Next we have Viscount Kaieda Nobuyoshi 海江田信義 (1832-1906), who contributed preliminary remarks to the book. He was born as Arimura Shunsai 有村俊斎 in 1832 as the eldest son of the Satsuma-han retainer Arimura Nizaemon 有村仁左衛門. In 1852 he went to Edo and there served as a tea-server at the Shimazu residence. Later in Mito he studied under Fujita Tōko 藤田東湖 (1806-1855) and Toda Chūdayū 戸田忠太夫 (1804-1855) and he was active in the imperial loyalist movement (anti-Tokugawa) of the time. He married the eldest daughter of Tōgō Heihachirō 東郷平八郎 (1848-1934), the Tōgō being one of Satsuma’s great families; in fact Kyūshū had been called “Tōgō’s Country” by one author. Meiji Restauration. After the Meiji-Restauration and the death of his opponent Ōmura Masujirō 大村益次郎, Kaieda had consecutive important offices as prefectural governor of Nara prefecture, member of the House of Lords, and consultant to the Privy Council. known of him personally, the BRD 1978 on p. 920 has an entry on a Washio-ryū. Although the name of the forefather of this style is not Washio Takatsumu but one Washio Haruo, the latter was not only a student of Imaizumi Hachirō, but also received Menkyo Kaiden from him. And he also became a Jūjutsu instructor at a police station. Thus this gives one more possible link between the persons contributing to this book. Last but not least we find one more interesting person mentioned in this book. As already mentioned, there is postscript written by Shinkage-ryū‘s Imaizumi Hachirō called “Meaning of the Jūjutsu Expert’s ‘Bonesetting Method’ (Sekkotsu) of Healing.” Imaizumi among others had studied Tenshin Shinyō-ryū Jūjutsu. This postscript was co-authored by one Yoshida Chiharu 吉田千春. Yoshida here is noted as the manager of the Ryūshinkan 柳眞館 dōjō of the Tenshin Shinyō-ryū Jūjutsu and he was a direct collegue of Iso Mataemon, the 5th Sōke of the style. he continued to study the style under the 3rd Sōke Iso Mataemon Masatomo 磯又右衛門正智. Kanō’s top disciples and two of Kōdōkan‘s “big four”, Saigō Shirō 西郷四郎 (1866-1922) and Yokoyama Sakujirō 横山作次郎 (1863-1912), studied Tenshin Shinyō-ryū in the dōjō of Inoue Keitarō 井上敬太郎 in Ueno, Tōkyō. Note that Hisatomi Tetsutarō, the compilator of the techniques to the book, possibly was one of the referees of the Jūdō vs. Jūjutsu tournament held in 1883 at the Tōkyō Metropolitan Police Station, and started to compile this book in 1884, just one year later. Below are two examples of techniques from the book. Iguchi Matsunosuke (ed./publ. ), Hisatomi Tetsutarō (auth. ): Hayanawa Kappō Kenpō Kyōhan Zukai, Zen (Complete Illustrated Book of the Teaching Methods of Tying, Resuscitation, and [the Jūjutsu method of] Kenpō). Tōkyō, Kinseidō 1898. 井口松之助（編者）、久富鐡太郎（著者 ）：早縄活法拳法教範図解・全。東京：金盛堂、1898。National Diet Library. This entry was posted in Book Reviews and tagged Adachi Ginko, Hayanawa, Hisatomi Tetsutarō, Iguchi Matsunosuke, Imaizumi Hachiro, jujutsu, Kaieda Nobuyoshi, Kappō, Kenpo, Shinkage-ryu, Washio Takatsumu, Yoshida Chiharu. Bookmark the permalink.